New treatments for neurological diseases could follow. Neurobiologists from the Francis Crick Institute and the University College London have taken a different approach to understanding the effects of aging on the human brain. Rather than focusing on the usual, which is looking at how neurons are lost with age, this team of researchers looked at supporting cells called glia and found a noteworthy phenomenon. 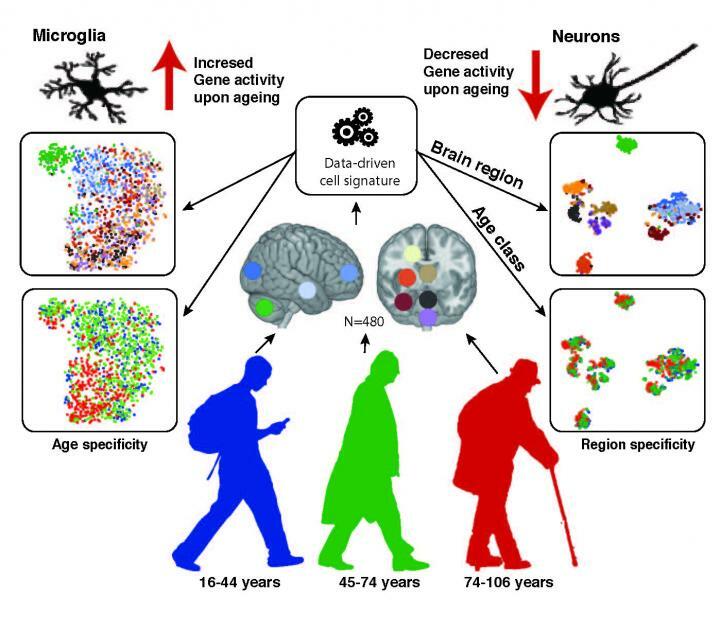 “We extensively characterized aging-altered gene expression changes across 10 human brain regions and found that, in fact, glial cells experience bigger changes than neurons,” researcher Jernej Ule said in a press release. In their study, published in the journal Cell Reports, the team examined postmortem brain samples from 480 individuals that died between the ages of 16 and 106. They found that the state of the glia cells in a brain were consistent with the deceased person’s age, so much so that they could identify how old someone was by examining their glia. Glia cells provide neurological support to neurons and come in three types, each with a specific support function. The oligodendrocytes insulate, the microglia function as immune cells, and the astrocytes assist with neuron metabolism, detoxification, and other functions. The researchers found that astrocytes and oligodendrocytes experience a shift in gene expression patterns (which genes are turned on and off) upon aging. This was particularly noticeable in the hippocampus and substantia nigra, two brain regions related to memory and movement, respectively. Meanwhile, there’s a notable increase of microglia-specific genes in all regions of the brain as aging occurs. The researchers also examined how these shifts in gene expression patterns relate to changes in brain cell populations by comparing tissue samples from three younger brains with three older ones. As Ule points out, that latter bit of information is of particular note. Neurological disorders that are age-related have usually been attributed to some form of lapse in neuron activity. By shifting the focus on these disorders to include glia, this study informs our understanding of late-in-life brain diseases, such as dementia and Alzheimer’s. Far beyond giving us a way to determine the age of a brain, identifying the effects of aging on glia cells can improve our understanding of how aging affects the brain in general. The researchers hope to learn whether gene expression can be affected by gene mutations and other variables in ways that trigger diseases. If so, they could use that information to help develop treatments for those brain diseases and battle aging in general.